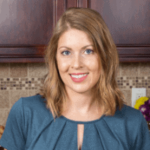 Published: Apr 28, 2016 · Modified: Apr 12, 2019 · By Jen Sobjack · This post may contain affiliate links. Soft pretzels are one of my favorite snack foods. There’s a shop in the mall that has the best soft pretzel bites and I just have to have them anytime we go. Today, I’m excited to be sharing a spring-inspired pretzel bite recipe that you can make at home. There really are only so many ways you can make soft pretzels and have them come out perfectly soft and chewy. I learned the basics last year when trying to make maple bacon fat soft pretzels. Several recipes were tested until I achieved the best texture for my taste. I think you are going to enjoy and appreciate this recipe. 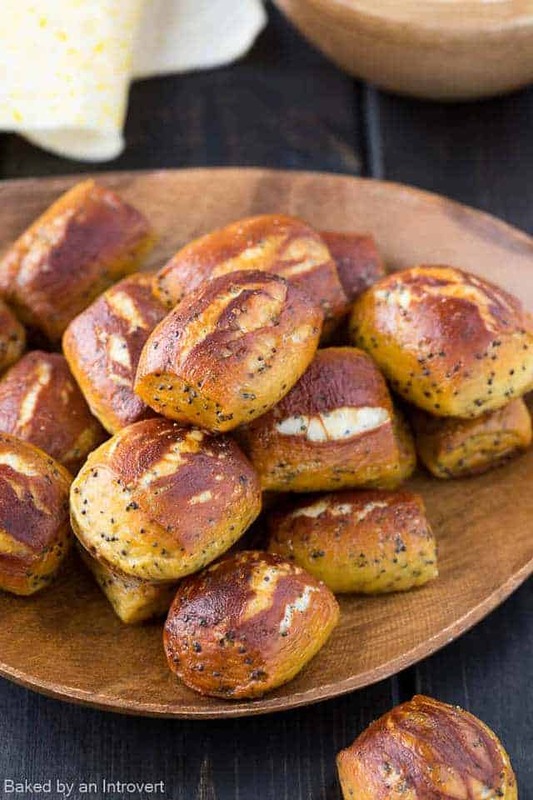 These Lemon Poppy Seed Soft Pretzel Bites are a fun new twist on my favorite soft pretzel recipe. They are some of the best sweet pretzel bites I’ve ever eaten. And so full of spring flare! 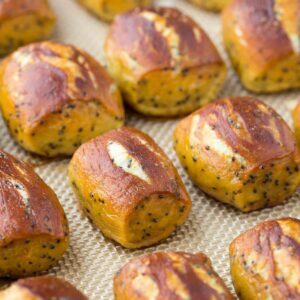 They are full of lemon and honey flavors with loads of poppy seeds speckled throughout. Homemade soft pretzels aren’t difficult to make, but they do take time. I suggest reading through all the instructions before you begin and plan ahead. The most important tip is to use high-quality yeast. We’re using Red Star® Active Dry Yeast for these soft pretzel bites. I’m a huge fan of Red Star® and have been for as long as I can remember. It yields consistent and reliable results. Using bread flour for soft pretzels is by far the best route to take. You want a dough that is stiff and sturdy. It’s an absolute must! The high gluten content in bread flour is what will give the pretzels that chewiness that is so well loved. You want to let the dough double in size before shaping it. This will increase the lightness of the texture inside the pretzel. I love a soft pretzel that is chewy on the outside and fluffy on the inside. Shape the dough by dividing it into 8 equal size pieces. Roll each piece into a 20-inch rope and cut the rope into 1 and 1/2 inch slices. If the dough is difficult to roll out and continues to shrink back, let it sit for about 5 to 10 minutes. This will give it some time to relax. Relaxed dough is easier to manipulate. The pretzels need to go into a water bath before baking. This is crucial for developing that dark shiny surface. It also helps keep the pretzels from puffing up too much in the oven. In a way, it sort of “sets” the dough. The water bath is simply water and baking soda. Boil the pretzel bites in batches for about 20 seconds. That’s all they’ll need. Just a quick dunk. Feel free to sprinkle some coarse sugar over them just before baking. I tested this recipe with and without it. I love the extra sweetness it provides. And as the pretzels bake, the sugar will melt and caramelize on the outside. It’s worth the extra step it takes to sprinkle it on. Bake them up until they are the desired color of golden brown. Some folks like their pretzels to be darker in color and some like them to be lighter. Just be careful not to underbake or burn them. 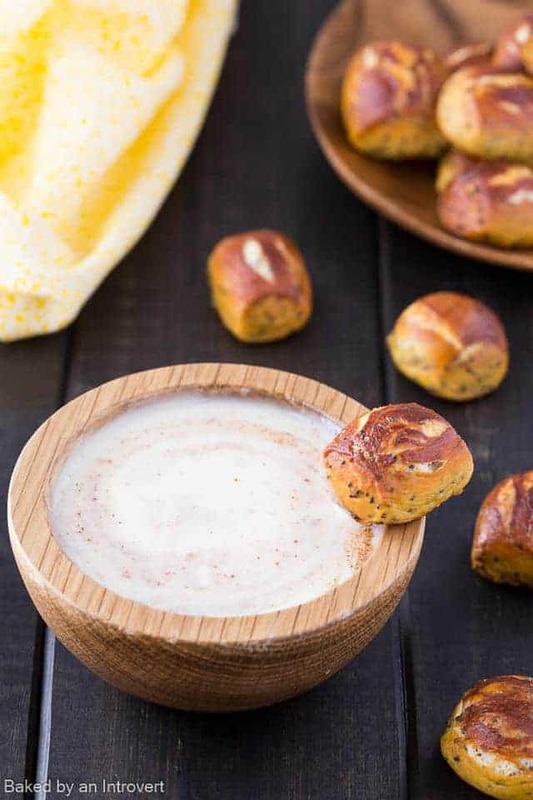 Serve the lemon poppy seed soft pretzel bites with a dip made of yogurt, honey, and a little cinnamon. Enjoy! To find more recipe ideas, check out Red Star® on Facebook, Instagram, and Pinterest. Add the butter, honey, and milk to a small saucepan. Heat over low heat until the butter has melted and mixture is steaming but not boiling. Pour the milk mixture into the flour. Add the lemon zest, lemon juice, and poppy seeds; stir with a whisk. Add the yeast mixture and stir with a whisk.Turn the mixer on medium low speed and gradually add 1/4 cup at a time of remaining flour until the dough is no longer sticky. Press a finger into the dough. If it bounces back, it is ready to knead. Turn the dough out onto a lightly floured surface and knead gently for about 5 minutes. Shape the dough into a ball and place it into a lightly oiled bowl. Brush a little oil over the top and cover the bowl with a tea towel. Place the bowl in a warm place to rise for 1 1/2 hours, or until doubled in size. Preheat the oven to 425°F. Line two large baking sheets with a silicone mat or parchment paper. Set aside. Using a sharp knife or the edge of a bench scraper, cut the dough into 8 equal portions. Roll each portion out into a 20-inch long rope. If the dough wants to shrink back, let it rest for 5 to 10 minutes. Cut each rope into 1 1/2-inch pieces. Just saw these on Pinterest! oh my gawd, can’t wait to try these! LOVE the flavor combo!!!! and they look so addicting! LOVE! Thanks! I hope you do give them a try, Alice!! These look perfect, Jen! 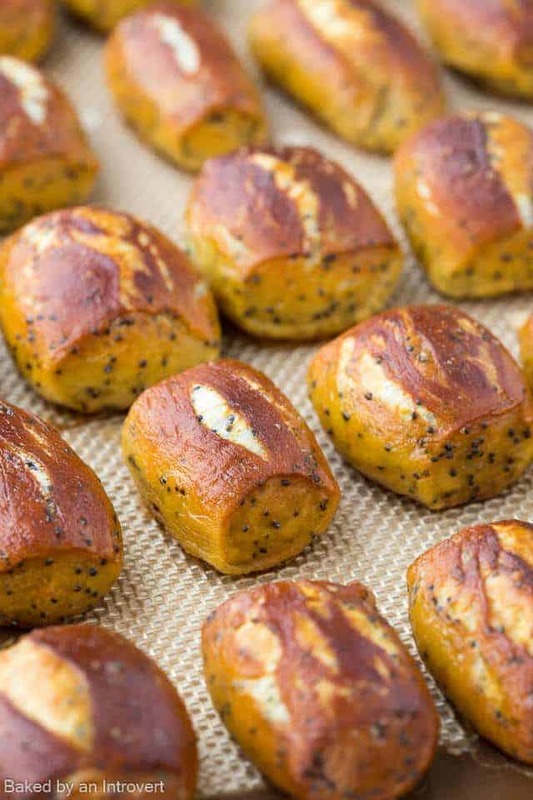 Love the lemon poppyseed twist on these pretzel bites! These would get devoured at our house in no time! Please do! You will love them!! If people are like dough, someone should let me relax for 10 minutes and then I might be easier to manipulate. But if they won’t, I’ll try it with these. They’re GORGEOUS! Hahahaha! That is the best thing I’ve ever heard!! Two of my favorite things wrapped up into one pretzel?! YES PLEASE! Oh my gosh, I need these in my life ASAP! Nothing in this world beats a freshly-baked pretzel! This bread is absolute perfection!! I’ve never made pretzels at home and these look amazing. The bite size will be dangerous around here. You have to make them sometime. They are so easy!! These pretzel buns are wonderfully golden! I love the idea of the yoghurt sauce with it – sounds delicious! Wait, whaaaaat?? 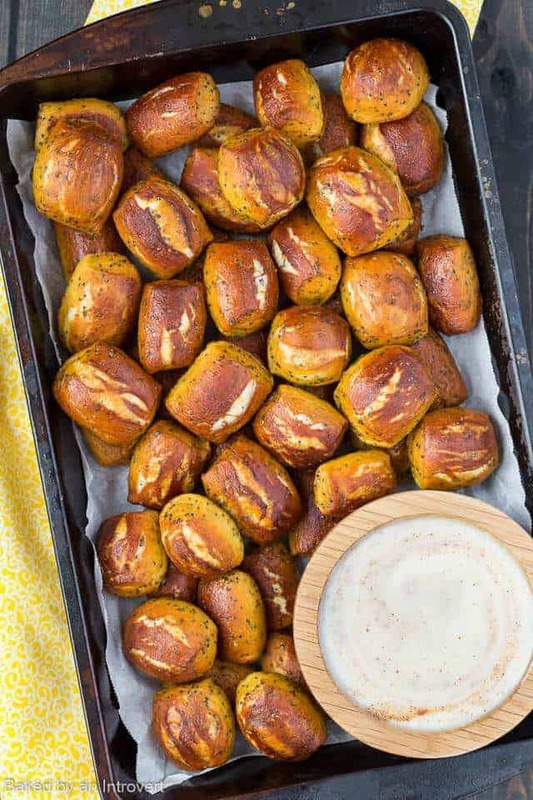 These pretzel bites are GENIUS, Jen! 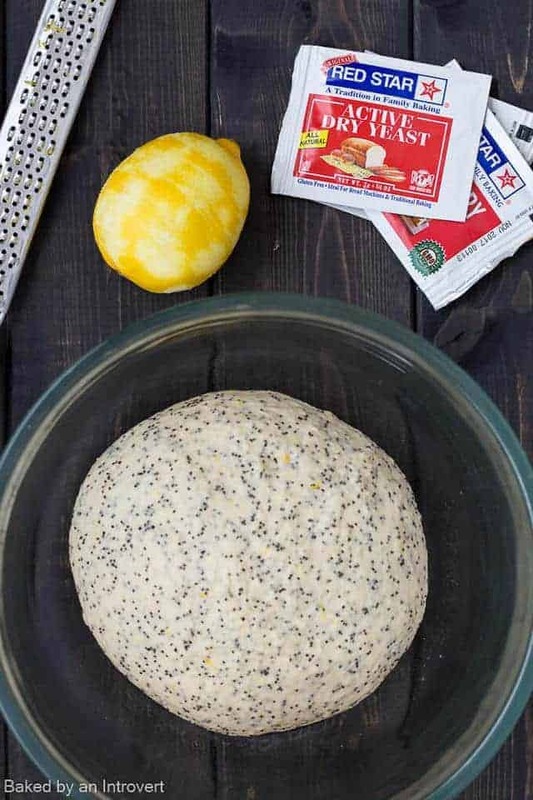 I’m a huge lemon poppyseed fan and you are totally my hero for putting it in soft pretzel form.—I’ve GOT to try these asap! Haha! I hope you do give them a try!! I absolutely adore soft pretzels too Jen. . .so much so that when I made business trips to Germany I always went out of my way to score a couple of homemade pretzels. 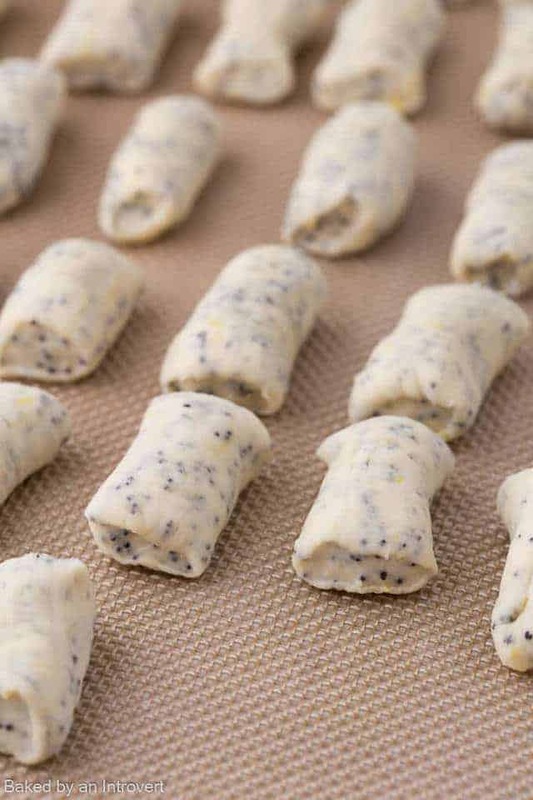 But with all the soft pretzels I have consumed in my life, I have never had them made with lemon and poppyseed but I bet they are absolutely scrumptious (especially dipped in that yogurt dip). They are truly unique and oh so yummy! I hope you get to try them!! They are so different! But they turned out wonderfully!! Thank you for pinning, sweet friend! These pretzel bites look amazing! I always get the ones in the mall and wanted to make some at home! Thanks for the great recipe! Pinning! I hope you get to try the recipe, Mira!! Oh my goodness there is just something wonderful about soft pretzels. They’re so addicting! These pretzel bites look so good. The poppy seeds sound delicious, and that yogurt sauce looks amazing! Right?! Once you start, you can’t stop munching!! I love the sound of these pretzel bites, they look delicious! I love pretzel bites, these sound fantastic Jen! Oh my goodness, soft pretzels are a HUGE weakness of mine, so I am swooning over these little bites! Not only are these so cute, I love that they are full of springtime flavor! Lemon and poppy seeds sound fabulous in here, and that honey yogurt sauce sounds like the perfect dip! This looks dangerously delicious, girlfriend! Cheers! Thanks, Cheyanne! Soft pretzels are the best! Thanks, Medha! We really enjoyed them!! Oh my goodness!! We love the pretzel shop at the mall, too — and the sweet pretzels are always my favorite! I bet I’d have trouble stopping at just a few of these spring bites! I typically go for the savory pretzels stuffed with mini hot dogs. Gosh, those are my weakness! But I’m loving this sweet version because they aren’t super sweet. Wow, what an awesome idea Jen! I love soft pretzels and love lemon poppy seed muffins. Never thought of putting them together! Perfect! Thank you so much, Mary Ann! We loved how these turned out. Jen, these pretzel bites are absolutely stunning! This reminds me of Auntie Anne’s Pretzels…I haven’t had those in years, but they were always a favorite of mine when I was little. I love that you made your own and flavored them with lemon. Such a great idea! Yes! I love Auntie Anne’s Pretzels! Anytime we go to the mall, I have to make a stop there. I love making my own at home though. They’re less greasy and taste much cleaner. The pretzels will remain fresh for up to 3 days in an airtight container. I don’t recommend freezing them.